January 5, 2016 - Hamilton School District. The Hamilton School Board chose to contract with James Rickabaugh Clarity Consulting for coaching services during its superintendent search process. Kathleen Cooke, Ph.D., who became Hamilton superintendent in 1993, announced her retirement in December, effective at the end of the school year. Rickabaugh, who has worked with the district on its strategic and tactical planning, will assist the School Board in each phase of the search including planning the search, developing a candidate profile, posting the position, establishing the process for accepting candidates, identifying finalists and conducting final search activities. In addition, he will assist in facilitating opportunities for public input. The board will pay him $9,000 for his services. March – selection and announcement of new superintendent. Staff members who attain a master’s degree pre-approved by the district’s Human Resources Department will continue to receive a $5,000 salary adjustment if it is attained by Aug. 31, 2019. After collective bargaining ceased with implementation of Wisconsin’s Act 10, the district offered the salary adjustment for those who completed master’s degrees by Aug. 31, 2016. The School Board’s action on Tuesday continues the practice of providing a $5,000 adjustment for the year if teachers provide documentation by Sept. 1 and $2,500 if notice is provided by Jan. 15. The supplemental salary increase is intended to recur each year as part of an employee’s total salary, but it will not be used in determining future wage increases. 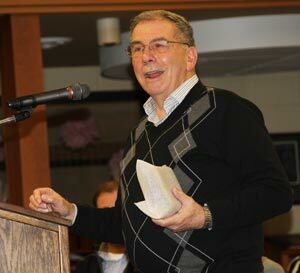 School Board members recognized one of their own, honoring Gerald Schmitz for 40 years of service on the board. Superintendent Kathleen Cooke, Ph.D., recited major accomplishments of the district since Schmitz first took office including academic achievement, facilities improvements, implementation of strategic planning, creation of the Hamilton Education Foundation, greater community satisfaction with the schools and establishment of 4K and expansion of 5K. Cooke said all of the accomplishments occurred because of set focused leadership that Schmitz contributed. Schmitz said the accomplishments of the district were the result of a team effort. “All of us together is what turned the district around,” he said. “It seems like it has been such a short time, but it’s been 40 years,” he added. Schmitz’s position on the board is one of two seats that are up for re-election, and he announced that he will not run for another term. Newcomers Jennifer Waltz and Jason Wegner, both from Sussex, will vie for his at-large seat in the April 5 election. The other seat up for re-election represents the Village of Sussex and is held by Gabe Kolesari who will run unopposed. appointed Nicole Tiutczenk as Woodside part-time replacement Early Reading Empowerment teacher.